Working on PIP, I’ve been getting used to seeing a lot of set-up products shots recently - these are a staple from the product manufacturers and PR agencies trying to catch the eye of the specifier with the perfectly set-up product shot showcasing it in all its magnificence. The sofa and coffee table placed just so on the new flooring surface, or sat in front of the glaringly clear expanse of glass to a patio beyond; whose sliding leaves, you know, will glide past each other as the living embodiment of Newton’s First Law. But it’s this assumed perfection that’s in a way its downfall - the hyper-reality of the image rendering the product in it in a sense incredible. So it’s refreshing to see a take on this commercial photographic typology on display at Last Seen Entering the Biltmore, the latest show at the South London Gallery, which ‘instead of conjuring illusory environments, knowingly discloses a perspective from the ‘backstage’’. Named after the last sighting of Elizabeth Short, the victim of the gruesome and sensationalised 1947 Black Dahlia murder; mixing paint, sculpture, film and installation, the show peels back the layers of artifice in the creation of spaces and attempts to show- what would it be now- the emptiness behind? So we are presented with the theatrical stagings of 1970s American artist William Leavitt, eliciting the blankness of southern Californian suburbs - and most tangibly related to those idealised product shots. But here, the artist takes framed generic pictures and places them on stage-set walls that are peeled away at the corners like a sardine tin; or creates the archetypal sliding door with patio and planting behind, only for it to stop short at its corners and reveal itself to the viewer as fake. 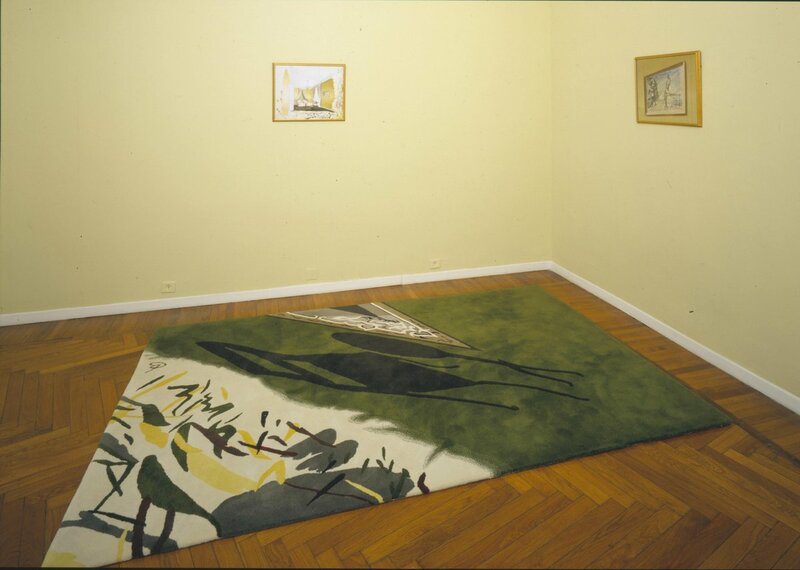 Artist Barbara Bloom’s 1997 work The Bedroom stems from her random purchase of a cheap watercolour whose removal of its frame reveals the processes that brought about the painting. In a similar way, the painting acts as a catalyst for a woven carpet, based on warped re-readings of the subjects of the painting. Here the mechanism of disassembling the painting goes on to produce a new iteration of the original object. But most architectural perhaps is the work of young RCA artist Richard Healy, whose mise en scène dominates the gallery. Here a pine and steel wall divides his hand-blown ornamental Martini jugs from a video that, to pumping techno, takes the viewer through a house based on the New York Fire Island architecture of Horace Gifford. Here the architect built dozens of homes in The Pines for the moneyed east coast gay community in the swinging 60s and 70s; and Healy presents us with his own fictionalised 3-D flythrough - from the cruising boardwalks into a meme of Gifford’s opulent, modernist pleasure palaces. With a narration that’s pared-back yet seductive as a realtor’s sales pitch, we are dreamily guided through the rooms - the indulgent perfection of the spaces jarringly at odds with the devastation that AIDS would later wreak on that same community. Another example of surface perfection tainted by painful reality, Healy’s is a journey as sobering as a Martini-loaded stroll through The Pines might have once been intoxicating.